A general hospital supported by the general public and admitting patients of all faiths. Offers medical and surgical aid and nursing to the sick and disabled, suffering from acute, curable, and non-contagious diseases. Maternity cases taken. Will not admit tubercular patients. Capacity, 76: sixteen private rooms and sixty ward patients. Admission to the hospital is by direct application. Charity cases taken by application to the Overseer of the Poor and on the written permit of a City Physician. No Clinics on Sundays or legal holidays. Surgical, daily at 12PM. Medical, daily at 12 PM. Diseases of children, daily at 11:30 AM. Diseases of women, Mondays, Tuesdays, Thursdays, and Fridays at 11 AM. Nose and throat, Tuesdays and Fridays at 4 PM. Eye and ear, Mondays, Wednesdays and Fridays at 4 PM. Skin clinic, Tuesdays and Fridays at 4 PM. On June 1, 1866 Pastor Lehlbach accepted the position of president of the German Hospital Association. Plans were submitted by architect Otto Gantner for a German Hospital to follow the recent opening of St. Barnabas Hospital by the Episcopalians and St. Michael's Hospital by the Catholics. This temporary association pressured the Newark Hospital Group to merge with the German Hospital Association. Events were staged to promote the hospital and raise funds. German donations far surpassed the donations from the other Newark groups and on January 19, 1868 the Germans split apart and announced they would build the Newark German Hospital. A charter was granted to the hospital on February 13, 1868 and Louis Greiner was named the first president. This German Hospital will admit anybody. This institution is organized on broad principles, admitting cheerfully the afflicted of every class, nationality and creed. The first patient was Carl Freiderich Fastnacht, with Richard Honold and Johann Freiderich Meier following him on December 27, 1870. The first American born patient was Carolina Marrion. All records for the hospital were kept in German. Some of the first "maladies" were - being crushed by railroad locomotives, kicked by horses, cholera, diphtheria, typhoid fever, tuberculosis, hypochondria and alcoholism. The first child born in the hospital was Alexander Humboldt Kuhm on July 27, 1871. The first doctors in the hospital were - Dr. Fridolin Ill, Dr. Julius Bruck, Dr. Charles J. Kipp, Dr. Charles F. J. Lehlbach (son of Pastor Lehlbach), Dr. Max Tissol, Dr. Ernest Schoeffler, Dr. Karl Vogler, Dr. Robert Staehlin, Dr. C. W. Hagen, Dr. Henry Kornemann, Dr. Edwar J. Ill, and Dr. Franz Lehmacher. Most of these doctors were trained in Germany, where the medical knowledge and techniques were ahead of American practices. The hospital struggled for many years to stay solvent. Fairs and other fund raisers were held from time to time to keep the hospital in the black. Charles Lindblau, the hospital's fourth patient left a small farm and house valued at $2,000 to the hospital when he died. The financial tide turned on May 3, 1881 when Mrs. Anna Ottendorfer announced that she would pay off the $2,000 remaining of the mortgage. Following that, the city agreed to pay $625 every three months for the treatment of charity patients and the breweries agreed to give the hospital an annual donation instead of continuing their practice of giving patients free beer. Further donations allowed the hospital to enlarge and to provide private rooms. Several entrances were in the plans to allow separation of patients with contagious diseases. 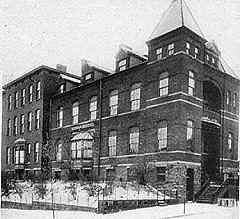 The hospital became the first isolation hospital in Newark. A nursing program was instituted with the recruitment of two Red Cross nurses from Germany and in 1892 the nursing school was started. Mrs. Trefz, wife of a brewer, purchased lots and built Trefz Hall, to be used as "The School of Nursing". The school was dedicated on November 30, 1893 and soon after a young seventeen year old girl applied. Her name was Clara Louise Maass. Among the hospitals of Essex County none stand higher on the roll than the German Hospital, and like other institutions of similar character, though young in years carries the honors of an ancient. It was incorporated February 15, 1868 and is maintained principally by the generous portion of the German American citizens of Newark, and has ever been conducted on the broadest principles of relief to the unfortunate, without regard to creed or clime.